Prof.Dr.S.Natarajan Android Conference Search app Get it at the blog -Know more by sending email to info@drsnatarajan.com Send Mail. Article in Tamil Magazine SIVAMALAR conti..
Prof.Dr.S.Natarajan hails from a long line of Ophthalmologists. His father Prof.Dr.N.S.Sundaram and grandfather, Dr. Nataraja Pillai, were Ophthalmologists of high standing in Chennai. This third generation of Ophthalmologist did his MBBS from Chennai. In 1982, he completed his post graduation in Ophthalmology from Chennai. From 1984 to 1988, he worked as a Vitreo Retinal Surgeon , under Dr. S. S. Badrinath, at the Sankara Nethralaya, Chennai. In 1988, he joined the Taparia Institute of Ophthalmology, Bombay Hospital and continued his work there till 1990. Later that year, he took the decisive step of laying the foundation stone of Aditya Jyot Eye Hospital Pvt. Ltd. and has continued servicing the institution in his capacity of Director, Surgeon and guide to a large community of Vitreo Retinal Specialists. He is one of the most high profile young surgeon and has received accolades from around the world. He has maintained keen interest in academics throughout his clinical practice. Prof.Dr.S.Natarajan and Aditya Jyot Staff Wishes Aishwarya Rai Bachchan a Happy Birthday!!! SSM Gold Medal Oration at cochin on 18th July 2009. Dr S Natarajan is appointed as Honorary Ophthalmic Surgeon of Governor of Maharashtra for 5 years. OTSI Annual Conference was inaugurated by Chief Minister of Delhi Smt. Sheila Dikshit. 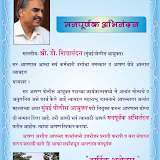 Prof.Dr S Natarajan is appointed as Honorary Ophthalmic Surgeon of Governor of Maharashtra. Global Health Champions. (Malaysia) signed a MOU with Aditya Jyot Eye Hospital Pvt. Ltd. to promote Medical Tourism. Rotary International District 3140 award to Dr S. Natarajan. 7th Euretina Congress,Monte Carlo 17-20 May 2007. APAO Distinguished Service Award 2006 to Dr. S. Natarajan. First Indian to Receive "Gusi Peace"Prize award to Dr. S. Natarajan. Dr. S. Natarajan partying and training for the Mumbai Marathon. Hon. Chief Minister Shri Vilas Rao Deshmukh visit. President visit at Aditya Jyot. Hon-Governor Shri S. M. Krishna Visit.